China’s foreign policy is based on four tenets called “Four Lay Outs” (四个布局). They are major powers as key, neighbourhood as the priority, developing countries as the basis and multilateralism as important platform. Within the neighbourhood, China follows a good neighbourhood policy (某邻友好政策). Weiqing Song, Assistant Professor in the University of Macau said that Good neighbourhood policy implies consolidation of friendly relations with neighbouring countries by “demonstrating good intentions, seeking partnerships and enhancing regional cooperation”. It is also supported by the Chinese Proverb that says “A close neighbour is dearer than a distant relative”. Basically, what it implies is that it is a policy that suits China’s growth. One cannot fault China for that because every country adopts a policy that suits its growth. In this article it is intended to analyse how this policy has panned out in India’s neighbourhood and what are its implications. Before we proceed further we need to understand another term called String of Pearls. 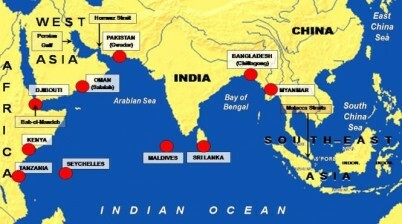 In 2004, the US consulting firm Booz Allen Hamilton came up with the “String of Pearls” hypothesis, which said that China will endeavour to expand her naval presence by building civilian maritime infrastructure along the Indian Ocean periphery. (See Map 1) Ministry of External Affairs in India did not accept the hypothesis at that time. However, activities of China in the last decade seem to substantiate that hypothesis. At present, one is seeing the combination of Good Neighbourhood policy and the String of Pearls hypothesis manifesting themselves in India’s neighbourhood. As examples, let us see Nepal and Bangladesh. With China occupying Tibet, the buffer that existed between China and Nepal vanished. However, China started becoming sensitive to the move of Tibetans through Nepal from India into China. Therefore, China started tightening the entry and exit norms along the China – Nepal border. An example of this is that China has restricted the move of Tibetans to India for the ongoing Kalchakra Festival and asked all Tibetan tourists to India to return by 03 January 17. In addition, she also started increasing her influence in Nepal. This activity was done in two forms. One, a total of 22 Chinese Study Centres came up all over Nepal. All of them are located in Central Nepal or to the South. Second, China started investing in many infrastructure projects in Nepal. In 2016, for the first time, her investments in Nepal have been more than that of India. (See Map 2). The infrastructure projects include five additional roads from Tibet Autonomous Region to Nepal, Road Rasuwagadi to Syaprubesi, railway link from Lhasa to Khasa and then onto Kathmandu, economic integration of the region, Optical fibre Link between Kathmandu and Khasa and construction of hydroelectric projects. Since 2008, Chinese investments in Nepal have been increasing and in 2014, it overtook India for the first time in terms of total investment in Nepal. In 2015-16, 42% of total FDI to Nepal came from China. Even in Overseas Development Assistance (ODA), China overtook India in 2015. China’s ODA has been growing steadily from $19 million in 2010-11 to $38 million in 2014-15. In 2014 – 15, India’s ODA in Nepal was $22 million. This increase in investments in Nepal by China is likely to allow China to increasingly influence the regional balance and reduce India’s role in the region’s narrative. Nepal is not the only country where China’s interests and influences are increasing. Bangladesh is another example. Bangladesh is not China’s neighbour in the true sense. However, China has been investing in Bangladesh heavily. In the infrastructure development for Bangladesh, six friendship bridges, a conference centre, a thermal power plant, a fertilizer plant are being done by China. Based on the Defence Cooperation agreement signed between China and Bangladesh in December 2002, a US $ 1.2 million gratis aid and a US $ 50 million loan was granted. Approximately 70% of Bangladesh’s military equipment is of Chinese origin. Recently, China sold two Ming Class submarines to Bangladesh. (See Picture below) China is also improving Chittagong Port. What all these countries should realise is to understand the plight of Sri Lanka. Having accepted an investment of approximately US $ 6 billion, approximately 30% of her total revenue goes towards debt servicing. One sincerely hopes that with approximately US$ 38 Billion aid, Bangladesh doesn’t fall into a debt trap. Similar will be the case with Nepal and other countries. With approximately, US $ 51 Billion investment by China in China Pakistan Economic Corridor, even Pakistan is very likely to fall into the debt trap. There are no free lunches in international relations and earlier the affected countries realise this the better they will be. This brings us to the point as to what India should do. Unlike her neighbours, India is not amongst China’s favourites. The reason for this is that India’s economic growth and her fiscal policies have ensured that her dependence on her economic relations with China is limited. With her size both geographically and economically, India can hold her own. For long, India had neglected her neighbourhood. However, there has been a change in her approach in the recent past. She has started concentrating on her neighbourhood. Dollar diplomacy is unlikely to pay dividends as China has a much bigger purse to win over these countries. India should use her soft power to start with. Countries in India’s neighbourhood look at India as a countervailing power. However, due to her earlier attitude there is also an apprehension that a big power like India could harm their interests. India needs to put their apprehensions to rest. Some bilateral issues like the Teesta River Water Issue and issues with Sri Lanka are being held to ransom by local politics. The regional parties need to rise above local politics and made to see the big picture. India should also concentrate on delivering the promises that she makes to her neighbours. India’s neighbours will take India seriously only then. India’s neighbours look up to her to share her economic prosperity with them. It is high time that India over looks her reciprocity principle in dealing with her neighbourhood and be more magnanimous in integrating them into her economy to the extent possible. China’s good neighbourhood policy seems to imply that her neighbours should be good to her. Whether vice versa is true is left to the reader’s imagination.